The Centers for Medicare and Medicaid Services (CMS) released a wealth of never-before-seen data on consumers applying for health insurance through the Health Insurance Marketplace this past week. From the data, we can draw some basic conclusions about Nebraska’s applicant population and hopefully inform our outreach and education for Open Enrollment 5 (2017-2018). In 2017, 70,778 adults selected marketplace plans in Nebraska (out of a total 84,371). Below is data related to race and languages spoken of marketplace applicants. 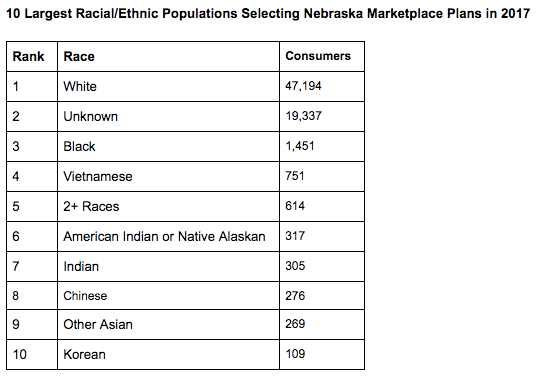 We can see what we might expect with White at the top of our applicant base given Nebraska’s population as a whole. Selections made by Black people come next, followed by Vietnamese people and American Indians or Native Alaskans. 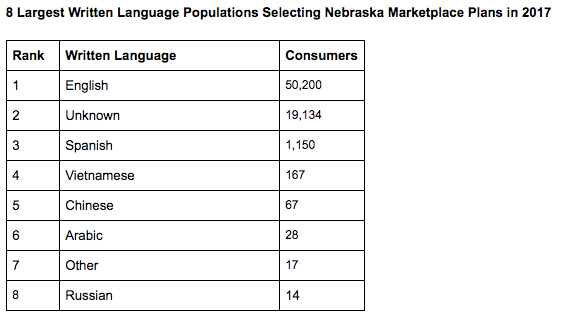 All other languages were zero in Nebraska, interestingly, given our high population of people with who speak Karen, Burmese and other languages. What kind of outreach are we doing with the Vietnamese population (3rd largest among applicants in Nebraska)? According to DHHS, Vietnamese people are the largest Asian population in Nebraska with a population of over 7,000 in 2015. Below is a map of Asian population density within our state from 2010. Other ethnic group data maps can be found in this 2015 DHHS report, including Latino, Black/African American, American Indian, and overall “minority” populations. We recommend you consider your own location and non-white communities when doing outreach to the various ethnic groups including those of which you are not a part. Use the data and make a plan. Can we develop partnerships and build trust with organizations serving Spanish, Vietnamese, Chinese, and Arabic speakers now? Are your marketing materials reflecting the most popular written languages of applicants in our state? Dollars are short to create and translate marketing materials, however targeting specific groups with the proper materials is essential. CMS has created some marketing and outreach materials that are translated into various languages. Find them here. Likewise, Enroll America has another toolkit to support your efforts at Engaging Ethnic Media to Help Spread Your Message. If you have a large population center in your area, consider outreach via this route including radio and television. We’ve compiled additional charts comparing Nebraska to our neighbor, Iowa, and the US as a whole from the CMS data on race, ethnicity and languages. Download it here. Thanks for taking the time to read, analyze and plan with us. If you have questions, feedback, or would like to profile your area more completely, please contact Eric Savaiano at esavaiano@neappleseed.org or (402) 438-8853 ext. 126.